Above is the (upcoming?) 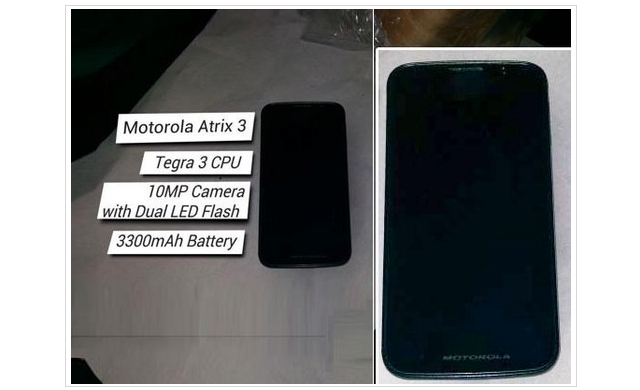 ATRIX 3 from Motorola which will probably have very high end features (if it’s released), such as a quad-core processor, if recent rumors are to be believed. According to Tian Jin Daily, the powerhouse will feature a quad-core NVIDIA Tegra 3 processor, a huge 3,300 mAh battery — the same size found in the Droid Razr Maxx — 2GB of RAM, a 10-megapixel camera with dual-LED flash (probably a front-facing as well) , a 4.3-inch display with a 720p HD resolution. It remains unclear when, or if, the ATRIX 3 will ever hit the market. If this smartphone hits the shelves we can probably expect Ice Cream Sandwich and support for AT&T’s 4G LTE network . Maybe we’ll hear more about the ATRIX 3 during Mobile World Congress next week, but we think it might still be a bit early for an official announcement. HTC One X – Will it be the final name for the Edge/Endeavor/Supreme?